My name is Drew Ramsey. To give you a flavor of who I am, I will make two comments. I am not into camping and I think chipmunks are cute as long as they are outside. Two months ago I went into my garage as I had numerous times before and to my surprise, I found overturned trashcans. Something had been looking for food. The raids on the garbage cans continued and I did my best to figure out what was doing this. I made sure the covers were on tight, and still, every morning they were off and the bags were ripped open. In my meager investigation, I found a whole in the rear of the garage. It looked as though an animal had created its own doorway by gnawing through the roof. I closed this opening with a piece of floor tile. The next day a new opening had been created by this animal so it could enjoy the meals found in garbage. My insurance company wanted me to eliminate the animal(s), reducing the likelihood of my returning with similar claims. They told me to try mothballs. I bought about 20 boxes of mothballs and put them everywhere. Whenever I opened the garage door, it smelled like a mothball factory. The animals still came. I moved the trash outside of the garage. Boxes inside the garage were being opened in a new search for food. Nothing was safe. Even a bag of fertilizer was ripped open. …so too were boxes of summer clothes, Christmas decorations, and extra pots, pans and dishes. After about a week, the animal found the trashcans next to the garage. They knew how to take the covers off of the lockable type too, even the empties. I tried sprinkling my secret habanera hot sauce all over the trashcans and bags. It didn’t matter. It kept happening. I didn’t really know what to do anymore until one very cold night. My chimney and fireplace was built like an old log cabin – open to the elements. That night, as I was touching up some digital photographs on my computer, I heard a sound from my fireplace. I had had an owl visit me once before. And before that, after four days of not having electricity, I came home to find small animal tracks going from my kitchen to the fireplace and straight up the chimney. So I firmly believe that we cohabitate with animals and I was ‘relatively’ ready to deal with an unknown. I was slightly startled to see what I thought was a pair of widely spaced eyes looking at me. It was very dark in there, and I could have been mistaken. I had a camera next to me so I took a picture. WOW! It was a raccoon! They’re okay as road-kill or in a park, but in your house the little critters are as big as a Great Dane (not really – but when it’s your house – yes, really!)! I calmly thought to myself “think calmly.” I figured he’d be here for the night since it was so cold outside, and as long as he didn’t try to bash through the metal ember netting and the glass doors, it was okay with me. Well, the next day came… and well into it, he was still here. So… I stopped working on my wedding photography project and went right on to Google. I searched animal removal-southfield, mi and in the first two or three names was one who called himself “trapper.” I didn’t have to look any further. I needed someone who had this kind of claim on his ability to do this work. “Trapper Ron” was his name as listed. I gave him a call and he said he’d be here within an hour. Wow, I thought! I needed quick help. He came over and I showed him where my new furry friend was. Well, I guess the raccoon started likin’ my fireplace and he climbed up beyond Trapper Ron’s pole-yoke could reach. So he set some traps and said he’d be back to pick it up in the morning. We talked the next day he told me the bait was missing out of two traps and a dish filled with bait was taken from a third. It was such a cold and dreary night, the traps had frozen open! So he had re-baited them and the next day he called to tell me he caught them. Them? !, I thought. No. Mine was still with me. So I was rid of two extra pests that I didn’t know I had! Trapper Ron came over with a jar of stuff I remember as Scent of Coyote. He thought this smell of a raccoon’s mortal enemy would certainly run it out of its new home. No, not this time. So Trapper Ron baited and reset two fresh traps. Trapper Ron said if he didn’t trap him this time, he’d bring “Trapper” Erik, his son, and they’d get him from either the fireplace or the rooftop. My furry friend was so smart, it did go out to eat, but it went to guess where… my garbage cans again! And then it came back in. Trapper Ron came over the next day and moved the raccoon to a position where it could be captured. And of course, I’m happy to be rid of my new furry friend… and his two pals! I am sharing this long story to tell you about raccoons. They are very smart and likeable. Even though I have learned much about raccoons through this experience, I am still very cautious about interacting with them. I must also speak about Trapper Ron. I watched him from a front row seat. In our case, the problem raccoon didn’t read the textbook. There are many things about Trapper Ron which I really like. He listens to you. He has an easy-going and pleasing personality. He gives from himself. He wants to do the job. He wants to work quickly on a very reasonable timetable. He has the experience and he has the equipment. If he needs a hand, he has Erik. And Erik seems to be relaxed and competent in this job too! If you need to have an animal removed, Trapper Ron will do it, answer your questions and maybe tell you a story too! Now I can concentrate on my Wedding Photography…or should I try Pet Photography? Trapper Ron's Humane Animal Removal & Relocation Services sales have exploded since a full page article was written about our services. Not only was our article full page, it was contained in Section A Page two of the Sunday edition of the Detroit Free Press. I would like to personally thank Joan Stewart from the Publicity Hound for her Newsletters particularly the one with the contact information that ultimately resulted in a great article. Our phones have been ringing off the hook and our sales have quadrupled since the article was released on March 11, 2007. Joan has been an inspiration for us and we now wait and read her newsletters with great anticipation. Free publicity can be challenging and trying; but when you have a pro giving you advice, it can be very easy. Trapper Ron Baker has over 20 years of wildlife control experience, stories and advice for you to enjoy. He has handled every thing from mice, squirrels, skunks, ground hogs, raccoons, birds, bees, muskrats, coyote, and opossum. Trapper Ron is licensed by the Michigan Department of Natural Resources as a Wildlife Nuisance Animal Control Operator. LC# RC613. The typical service includes setting live traps, daily baiting, and removal of all animals for one standard fixed price. Our competition charges a setup fee and a per animal fee. This can get very expensive particularly if they catch animals not targeted. As always, anytime you require a professional trapper, make sure they are licensed with the Michigan Department of Natural Resource and insured. Cost varies greatly so do your homework and call several trappers and compare pricing for the services offered. Ron Baker is the owner of Trapper Ron’s Humane Animal Removal & Relocation Services located in Farmington Hills. He assists homeowners and business with all wildlife nuisance issues in Farmington and surrounding cities. 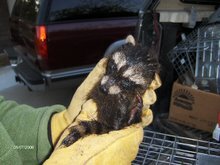 Re-Post of "Don't Forget The Little One's"
Lately I have been hammered by phone calls already this spring about raccoons in attic spaces where home owners remove thier own raccoon. It seems simple enough, go to the store buy a trap, bait it, relocate the trapped raccoon..... right ! Lately we have received calls regarding adolescent raccoons in attic spaces, under decks and in crawl spaces throughout the area. These animals were abandoned by the mother, possibly the mother was killed on the road or was trapped by a homeowner and relocated to a nearby park. This time of year when the adult raccoon is removed or relocated by a homeowner, they could be causing another unforeseen problem for themselves. Over the years I have accumulated story after story from experiences dealing with nuisance animals. The following is another story where homeowners thought they were solving a problem only to cause another.Not to long ago I received a call to help with a problem a resident was having. Apparently something was making scratching noises in their attic space and they needed someone to come and check it out. Over the phone they told me that they constantly see squirrels on their roof and wondered if one had made its way into their attic.Upon the arrival of our new client’s home, we noticed that the property was heavily wooded with several trees growing up against the house. My first mental note was to have the homeowner trim back the trees far enough to prevent animals from climbing up and jumping onto the roof.The homeowner greeted us outside and after an introduction and a few pleasantries; my attention turned to a large live trap in the garage. The homeowner explained that a couple of days ago, he was experiencing a problem with a raccoon stealing the grease drip pan from his barbecue grill. He had successfully trapped and relocated the problem raccoon to a nearby park. As he was telling me this, I could see the cartoon light bulb dimly lit over his head. He continued to explain that, a couple of days later he and his wife could hear meowing and scratching sounds in his attic. They feared there might be animals in their attic so they decided to call in a professional. As he concluded his story, at this point the light bulb was fully lit, he asked if it was possible that he removed a mother raccoon from babies in the attic. My thoughts exactly….As my son, Erik and I lifted ourselves into the attic we noticed that the screen from a rotary roof fan had been chewed, mangled and laid on the insulation just below leaving an opening for animals to enter. Further inspection showed an unbelievable amount of raccoon feces spanning the entire attic area. Some feces looked dried and as if it had been there for several years. Mental note #2, all of this feces is a calling card for other Raccoons and the homeowner need to clean it up as quickly possible.The highest point in the attic was only four-foot tall and it angled down in four directions towards the outside eaves. We did a cursory scan of the attic space and discovered that thereLittle Raccoon Trapped in an Atticwere no animals visible. We sat in silence for a few minutes until we heard the faint meows of adolescent raccoons. After a more detailed search we located the two small animals. They were tucked deeply in one corner of the attic near the lowest point of the rafters and behind electrical wiring that had been chewed upon. Mental note #3, electrical wiring needs to be repaired before it becomes a fire hazard. I crawled on my belly, as close as I could; however I wasn’t able to reach them by hand. I tried to extract them with my catchpole only to have them disappear into the eaves. We decided to set live traps and wait it out. As we left for our next assignment, I was concerned if the raccoons possibly still nursing; would they be tempted to enter a trap with solid food. Several hours had passed when we received a call from the homeowner. They heard the trap set off and as instructed they called us on our mobile telephone. One down, one to go. A couple more hours later we had the second raccoon. Before we left I made several recommendations from all of my mental notes and other standard common sense suggestions to prevent future invasions.While driving away we determined that the adolescent raccoons had been without their mother, food (other than what was in the trap as bait) or water for at least 4 days. Erik and I decided to bring them home to re-hydrate them before releasing them back into the wild. It is very satisfying to us to be able to release these and all animals back into an environment conducive to their well-being. They were sent off well fed and well hydrated and most importantly they were released to experience a new world together.These two raccoons were very lucky, if the homeowners hadn’t heard them meowing; they would have soon died. The homeowners were equally as lucky, if the raccoons had gone un-noticed and died, the aroma from the decaying carcasses would have been overwhelming for at least a week.Never approach a wild animal including infant, adolescent or adults, unless you are 100 percent positive there is no danger. Even infant wild animals can cause serious damage to a finger or a hand. The Infamous Uncle Don - Squirrels That Bite ! Careful review of the situation requires common sense. Never approach a wild animal unless you are positive there is no danger. Over the years I have accumulated story after story from experiences dealing with nuisance animals. The following is another story where common sense failed and the outcome turned out to be a painful lesson. While growing up we would visit my Uncle Don and Aunt Jane’s home on the East Side in Warren. I need to give a little background on Uncle Don. Uncle Don is a great guy who would do anything for anyone. The problem: Uncle Don has extremely bad luck when it comes to his hands and fingers. For as long as I can remember he never had all ten digits on his hands. Uncle Don worked in steel plants, most of his life, where there was an inherent danger usually causing injuries to hands and fingers. His most recent injury was caused a week before his daughters wedding. He was loading a truck with large steel coils when one fell off and rolled towards him. At the last second he managed to push himself out of the way, unfortunately his hands were slightly crushed in the incident. Since his hands were bandaged, his dinner at the wedding had to cut by his wife. Now that you know about Uncle Don, let talk about animal safety. Uncle Don isn’t a careless man by any means, just un-lucky when it came to his hands. I was told of a story that happened many years ago. Uncle Don went camping up north with some friends and relatives. They where having a fun spending time in the woods hiking, biking and enjoying the fresh air. Uncle Don while hiking came across a squirrel, which appeared to be dead in the trail. He examined it for a while and decided that he would take it back to camp for everyone to see. Uncle Don knelt down then reached out to pick it up. The squirrel regained consciousness just as Uncle Don attempted to grab it by the tail. The squirrel twisted around and then bit down on the tip of one of the two remaining fingers on Uncle Don’s right hand. In a panic Uncle Don swung his hand, in a whipping motion, trying to get the squirrel to release his finger resulting in the squirrel to clamp down harder. Every attempt to shake the squirrel loose didn’t work. Frantically Uncle Don, not sure what to do, started to slam the squirrel up against a tree trunk; still the determined squirrel would not release its bite. Witnesses in the area say that they saw a person running around in the woods like a madman screaming in pain and begging for someone to help him. Not knowing what else to do, he noticed a stream, he ran to the edge and dunked his hand into the water. Uncle Don was amazed that that squirrel didn’t immediately release its grip. Unfortunately the squirrel drowned and still the squirrel wouldn’t let go. With the animal, now dead, hanging limp off the tip of finger, he decided to go back to the camp. When the initial laughter subsided, his comrades, realizing this was a serious matter contemplated how to get the varmint off of Uncle Don’s finger. They tried a number of ways but eventually they had to pry the squirrel off of his finger with a pair of pliers. To this day, Uncle Don tells this story whenever he sees squirrels in the yard; it seems to get funnier every time he tells it. My point in telling this story is that squirrels are wild and unpredictable animals not to be taken for granted. When I hear that people are hand-feeding squirrels in the neighborhood, I think about uncle Don and wonder what it would take for the squirrel to latch onto the hand that feeds it. Moral of the store is to let your common sense dictate your actions and never hand feed wild animals, they have teeth and they can bite; just ask Uncle Don. To Subscribe to Our Quarterly Newsletter goto http://www.trapperron.blogspot.com/.